Inspired by the eponymous film I present to you the "All This and World War II" Geeklist. All the games that cover the entirety of World War II. While not the best game to cover the entire war, this game may be the best loved. In either case it is still the game most of us cut our teeth on. One of the the most detailed games covering this war, or any war, this is one game I will probably never convince my group to try (The rulebook alone is over 200 pages). Not just a single game, World in Flames is a complex family of games that covers every aspect of the war, from the political, to the economic, to the strategic. Sadly, at $500 for the complete family, this is also another game I'll never get the chance to play. With fourteen (14!) games in the series, I have to seriously question if anyone has ever successfully played the complete Europa series in a grand campaign. Still it's on the list because it could cover (nearly) all of the war. 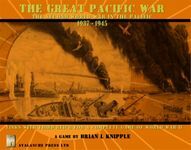 Quite pricey, and complex, this game covers the whole of the war, asking players questions few other wargames bother to deal with: "At what price victory?" Add Advanced PTO and... never mind. From the heydey of SPI. I'm not especially familiar with this one, but, in spite of the misleading name, it does cover the whole of the war. Another game I have not played, but it covers the whole of the war. This, and you have it all. Actually just got the 2016 version by One Small Step. Really interesting.